What is USB Flash Drive? USB Flash Drive Explained. USB flash drive is a small portable device that uses a tiny Flash Memory chip to store data. USB flash drives are designed small, light weight and more reliable than the normal storage disks. You can store or read data from it. It is due to its compatibility that it has been nicknamed ‘thumb drives’ and ‘pen drives’. A typical USB drivers consists of integrated Universal Serial Bus (USB) interface and a USB connector housed in a Plastic covering. The connector is made up of a motherboard onto which surface integrated circuits are mounted. USB flash drives has alot of uses. They can be used to carry PC settings, software applications, files, documents, movies or run troubleshoot for PC diagnostics. One big advantage about Flash Drive is that you can carry it with you to anywhere and Use it in any computer. Connecting a USB Flash Drive into a computer is pretty simple. Before we teach you how to connect it, we will first have to understand different USB drive specifications so that you can choose the best.Basically, there are three main specifications of USB drives namely, USB 1.0, USB 2.0 and USB 3.0. However, there are still other versions such as USB 1.1 which are the modifications of the three. Introduced in 1997, USB 1.0 came in two versions. The USB 1.0 low speed which offers 1.5 megabytes data transfer per second (MBPs.) . The USB1.0 high speed offers 12 mbps data transfer. However, the performance of this version was poor and two years later a newer and more superior version was developed. Released in April 2000, this version has performed extremely well in the technology industry. It is widely known as Hi-Speed USB and nearly all USB cables supports USB 2.0. With a maximum data speeds transmission of 480Mbps, USB 2.0 is more faster than the previous versions. A more important feature of this version is that it is backward-compatible ,thanks to its state of art design. One can now connect the USB 2.0 devices(What is the USB 2.0 Flash Drives) and cables with the USB 3.0 devices and devices and all will run usually when compatible. However, the speed will be much lower that speed of USB 2.0. Introduced a decade ago, USB 3.0（What is the USB 3.0 Port） is the superior version of USB 2.0 and new features has been added. With first data transfer rate of 5 gigabytes per second (GBS) , USB 3.0 has portrayed super -speed data transfer. It has an ability to reduce power consumption when idle. The USB 3.0 has a backward-compactible enabled feature and hence you can comfortably connect it to USB 2.0 devices and cables. At least a good knowledge of the USB flash drives, below are step by step on how to connect USB flash drive to PCs. 1. First, you will have to install necessary drivers to your PC. Drivers is an intermediate that allows your PC communicate with the drive. 2. Secondly, insert you USB flash drive to the USB port on your pc. Position of the port may vary with your computer as some located on either sides while others on the back. 3. Once done, a dialogue box will appear on your PC. Not all pcs will a must show dialogue box as some will directly go to Open folder to view files. Click this catergory to view your files. 4. If for instance neither the open files nor the Dialogue box catergory appears, don’t worry. 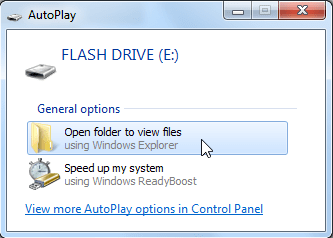 Just go to start and click my computer then on left side of you screen, the flash drive will appear after which you will choose. 5. When the flash drive is connected, you can copy, delete or modify files on it. To copy, right click on what you want to copy and the n move it to where you want and right click once more and paste. To delete, right click the files and click the delete section. 6. Once you have finished copying files from the flash drive it is advisable to safely remove it. Right click the flash drive and eject it. 7. Once successfully ejected, you can now pull out your USB flash drive. With all the above information, you can now comfortably go to buy your USB flash drive and connect it to you PC. We can however advise you to try choosing among the following list as they were the best usb flash drive for movies in 2017. Patriot Supersonic Rage , Kingston Technology DataTraveler 100 Generation, SanDisk Extreme CZ80, Verbatim Pinstripe, PNY Turbo 256GB and Patriot Supersonic Mega. Here’s the best USB Flash Drive for Movies 2018.